Hi everyone! Happy Memorial Day weekend. I hope your weather is as nice as ours right now & you are out enjoying it! 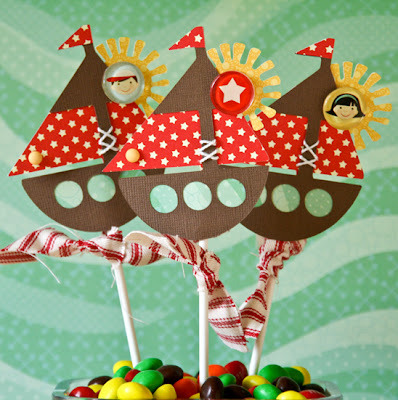 I have a really quick project that I made for the Pink Paislee blog today. This is a candy centerpiece that I made for Nico's birthday party this summer. 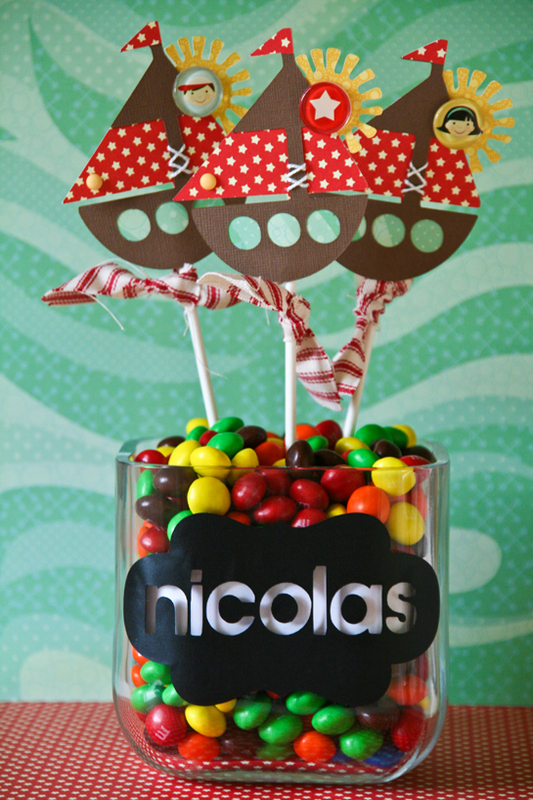 I love how it's decorative, personalized and good to eat. I love these chalkboard stickers and they were really easy to cut with the Cricut Expression. For more details and sizes, please visit the Pink Paislee blog here. I wasn't sure about this vacation. We knew we wanted to go on a cruise and while I tried to book the Disney Wonder it was completely sold out until the Fall. So we researched and came up with this 10-day cruise from NYC to the Caribbean. Good in theory, but 10 days of togetherness in a 205-square foot cabin - I wasn't so sure. So we headed out of New York City and boarded the ship under very heavy security. The Intrepid was docked directly next to us and Nico was fascinated by all of the small airplanes and submarines on display. Crossing the harbor, we passed the beautiful Lady Liberty. Such an amazing sight. We told Nico the story of how his Nonna (grandma) came through Ellis Island when she was about his age. He couldn't believe his Nonna was ever 5. The very first day at sea it was warm and Nico headed straight to the pool. And proceeded to go up and down and up and down that slide 5 million times. This was a Nickelodeon Cruise so we got to meet Sponge Bob, Patrick Star, Dora, Diego and his favorite - Fan Boy and Chum Chum. He got called to be on stage during the Nickelodeon Slime Time Live show. He hammed it up and wasn't a bit intimidated by the hundreds of people looking at him. Actually, I think he was loving the attention. Participating in the kid's Pirate Parade onboard. And running, running down those long hallways looking for our cabin. Do you know how many times Mama said "Nico stop running, Nico be quiet there might be babies sleeping, Nico mind the people around you, Nico say thank you, please, let the ladies off the elevator first." Reminding him of his manners is like a full-time job. But we refuse to give up. He will be polite (even if I die repeating myself). Ha! Learning to play shuffleboard for the first time. After 2-1/2 days at sea, our first port - Puerto Rico! I have never been so glad to see firm ground in my life. Climbing, climbing, climbing Fort San Cristobal in Old San Juan. Nico loved touring the dungeon, sleeping quarters and cannons in this old Spanish fort. The views from the top were beautiful. The cobblestone streets of Old San Juan. One of my favorite places in the world. I can "feel" the history here. It's a place my grandparent's brought me to when I was right around Nico's age, so this was a special spot for me. He doesn't eat grilled cheese, snubs pizza and hates hamburgers. But a spicy Puertoriccan empanada from a street vendor - that's a yes? And then he went on to eat a second one. Look at that grin - all because he got his father to pick him up and carry him up those stairs. We had the most delicious dinner in that restaurant - one of my favorite memories and meals. He learned to snorkel and give that lovely fake cheese smile in St. Thomas. Ha! Pretending to go overboard in St. Maarten. This was one our favorite experiences of the entire trip - swimming with the dolphins! They are beautiful animals and to actually swim in their habitat and learn to give commands was amazing. He is still talking about that dolphin and keeps telling everyone that he went inside the dolphin tank - but it's okay because he's a trainer now. And yes, I went on the trip too. I was really bad about handing the camera over this time. I'm grateful that the ship's photographer took a bunch of family photos or I'd have none. Nico learned so much, laughed a bunch, met friends from around the world, had a lesson in navigation, swam with dolphins, had his passport stamped, met a real ship's captain, participated in a live stage show, discovered snorkeling and when asked what the best part of the cruise was ----he said to me "my Dad didn't go to work for 10 whole days and spent all of his time with me." And that concludes this EPIC post. Thanks for staying with me! I have a few new projects and pages coming very soon. Sharing my latest from the 2Peas Garden Gallery. One of my favorite things about this time of year is the Spring Show Nico's school puts on every year. I mixed up six different manufacturers to come up with this springy, happy design. I wrote the title on this chalk board square from Canvas Corp. 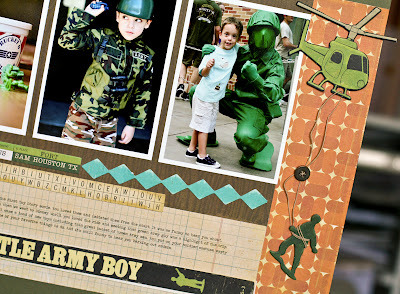 They make all kinds of interesting odds and ends for scrapbooking including tags, burlap, chalkboard and fabric pieces. I wrote the title with a white gel pen and then added layers of chipboard, a kraft envelope and rope. Finally, I cut up two layers of fringe grass and added them just below the "happy" stickers. I've listed all of the products used on this layout in the 2Peas gallery here in case you were curious. Enjoy your weekend and I hope it's "springy" wherever you are! I have some older projects to share with you today. The first is an old Work in Progress kit project that I forgot to post. These pictures were from my grandmother's 89th birthday this year. I must've had my camera on the wrong settings, because almost all of the 100+ pictures I took did not come out. I hate it when that happens. I made do by combining some of the salvaged shots into a photo collage in Photoshop Elements. I thought they still told the story and look aesthetically pleasing on the page. This is a Cricut trinket box that I created for the Cricut Circle a few months ago. 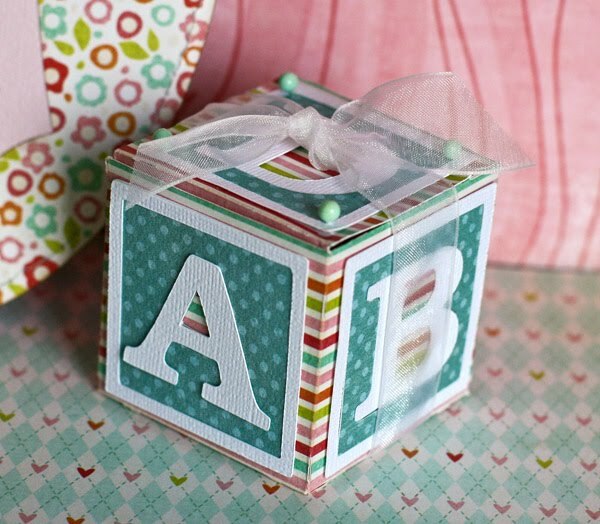 It's one of many boxes that you can make from the Wrap it Up cartridge. It was very easy to put together and decorate. I think it's perfect for a baby shower favor (maybe filled with a cupcake or some chocolate). All of the paper is from My Mind's Eye and I dressed it up with organza ribbon and aqua brads. I love coming up with party ideas using my Cricut. Look for more of these in the future! We've been going to a ton of family parties lately. There have been 3 birthday parties, a bridal shower, a wedding, 2 baby showers and 1 communion. Being part of a large family, that's pretty typical for this time of the year. Last weekend, we celebrated my husband's niece's communion. The boys dressed up for the occasion. Nico insisted on the shirt and tie because he wanted to match Dad. He looks so grown up here. Our niece's communion class. Look at all of those pretty little dresses. Nico kept saying it was his cousin's wedding. I guess he's right, that's exactly what it looks like. I don't remember communion being quite this bridal when I was growing up. Picture anyone? I thought this was such a funny shot. Talk about jostling for a photo. And lastly, Nico and his aviator shades. He insisted on wearing them in every single family shot. I laugh every time I look at this picture because he looks like a "fed" or some miniature CIA agent. Notice the pout too - apparently the sunglasses give him attitude. Ha! So that's a little peek at what we've been up to lately. Waiting on summer, tons of parties and T-Ball. Oh lots of T-Ball photos and stories - but that's a post for another day. Be back soon with a birthday idea and a Cricut trinket. The desk is clear. All of the assignments are complete. And now I need to KEEP CALM and CARRY ON. There is definitely a reason why I hung that sign directly in front of my desk. And after this week, I really need to remember it! This is an old Cricut Circle project that I made right around the holidays this year. I used the Gingerbread Seasonal cart to weld these cookie images together. I thought they would make a cute border for my page. The journaling and photo "wreaths" are from the Heritage cart. All of the paper is Echo Park's Everybody Loves Christmas. This was a fun and quick project to document the only TWO photos I had of Nico and I making a gingerbread house. I was so into protecting that poor gingerbread house from a very excited boy that I didn't take many photos. I'm busy working on projects for the 2Peas Garden Gallery. I'll have a new page up on Monday and some weekend photos up soon. I am so glad that he was born after 9/11. Glad that he's too little to understand what's happening in the world. I can still shield him from the news. And yet, the reality of terrorism hits way too close to home without him even knowing it. His father rode a train last night protected by a machine gun toting policeman. His aunt works on Wall Street where the lobby of her office building now includes bomb sniffing dogs. He plays with a little boy who's Dad died in the Twin Towers. It's touching his world - this terrorism thing. And there isn't a single thing I can do about it. Except pray, have faith and wait on the world to change. 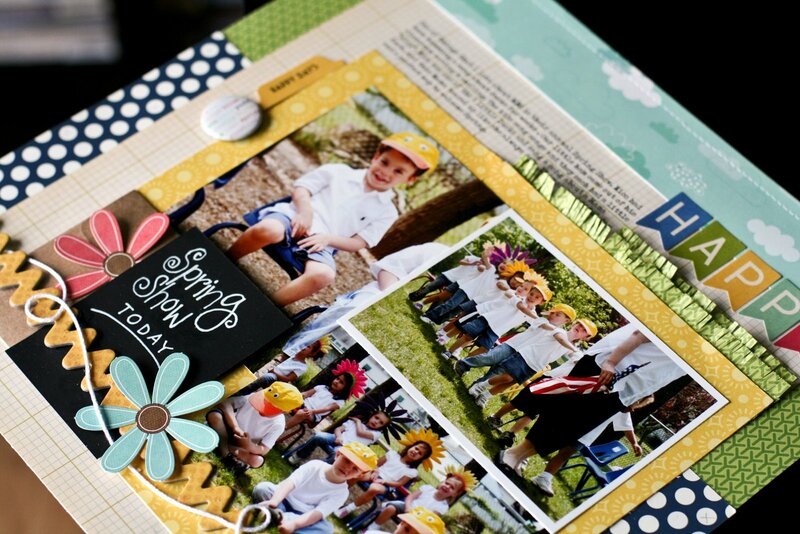 I made this layout for the 2Peas Garden Gallery with one of my favorite boy collections ever! Kudos to Crate Paper for making something that is perfect for all of my boy's pictures. Nico fell in love with the Green Army Guys from the first Toy Story movie he saw 3 years ago. Since then he has collected all of toys, the soldier costume and walkie talkies. All of the papers and chipboard are from Crate Paper. 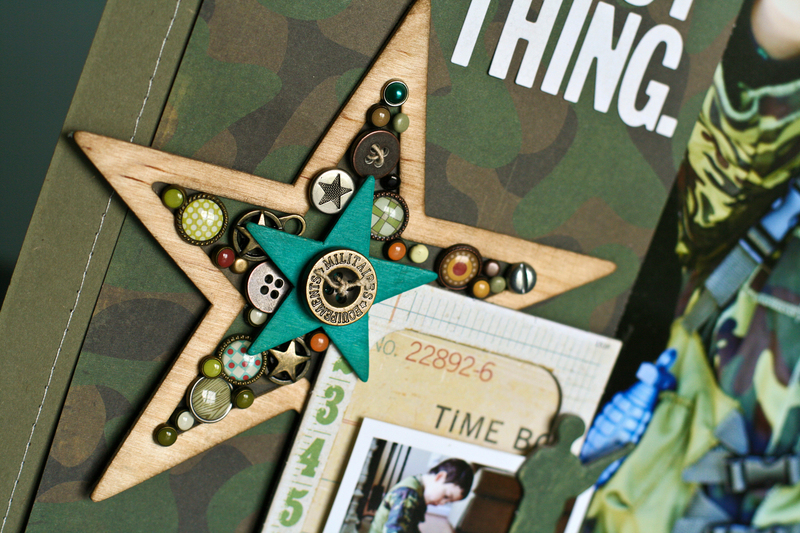 One of my favorite parts of this layout is the wooden star filled with brads. I like how it looks like a jumble of toys. The right side includes lots of stickers from the Toy Box collection and strips of patterned paper. And lastly, a little hanging green army guy. That's Nico's favorite part. This layout is now hanging up in his playroom. He loves the picture of himself with the Green Army Guy in Disneyworld and every once in a while I catch him saluting it. Crazy boy. I'm busy working on assignments this week. Trying to get ahead of the game before we go on vacation. Five projects in three days - I can do it right? Ha! I'll have some photos from the weekend and a Cricut project coming up this week. Have a good one!